Unfortunately, it is becoming more and more common that there are posts about members shuffling off this mortal coil. No one lives forever, and our membership skews up in age. Many of the ills that afflict and take the lives of people are entirely preventable: heart disease, strokes, the vast majority of cancers, diabetes, obesity, etc. What is this magic prevention I am talking about? It is simply fixing your diet: plant-based nutrition with no oil. That's right, humans are not built to regularly consume meat. We don't have the physiology of carnivores or omnivores. I am certain this will be a controversial topic for many if not almost all of the readers here. And very few will have an open mind. Fair enough. In large measure a willingness to consider something like this is a generational thing. Therefore I will be brief and then just point to two website. Why don't you hear anything from your regular physician, cardiologist, rheumatologist, etc. about the importance of nutrition? Two main reasons: first, almost all physicians receive essentially no training in nutrition. Second, guiding a patient to fixing his or her diet is not very profitable. I am not a cynic but am a skeptic. People, including those in the medical profession, respond to incentives. The incentives lie strongly in promoting expensive pills and procedures, whether they are effective or not. Fixing your diet is too simple, yet it is by far the best and most powerful thing you can do to improve your health. What about getting enough protein? The fixation on protein is almost exclusively an American phenomenon (thanks to advertising and lobbying by the beef, dairy, and egg industries). It is almost impossible for anyone eating any kind of reasonable diet and getting enough calories to not get enough protein. And don't fall for the complete protein nonsense. That dates back a hundred years to experiments done on rats, not human beings. Lettuce (!) is 17% protein by calories. The two websites are http://www.dresselstyn.com and http://www.drmcdougall.com. Both espouse plant-based nutrition with no oil. Esselstyn is a world-famous physician working at the Cleveland Clinic. His emphasis is on arresting and preventing atherosclerotic heart disease. There can be reversal also. On his website are arteriograms showing plaque reversal - amazing stuff. He is basically the first to ever prove that this can happen. McDougall is a world-famous board-certified physician practicing in Northern California. He emphasizes combating autoimmune disorders, obesity, type-2 diabetes, heart disease- a host of chronic illnesses. There are several very inspirational videos and case histories on his website. If you listen beneath the din, you can hear this message in many places. Pills and procedures can not provide a cure because they do not address causation. Fix the fuel! Here's the 356 connection: the healthier and longer we live, the longer we can enjoy our cars and each other's camaraderie. "What is this magic prevention I am talking about?" If you'd prefer, I'll be more than happy to take a "magic" claim apart piece by piece, but I doubt you'd like it. So I suggest very strongly that you re-label this thread as, oh, "A highly personal opinion of nutrition". Or perhaps "Why testimonials are more important to me than actual research". Or maybe "Why colorful websites are persuasive". Edwin, I knew I would like you. Just know there are believers and non-believers out there. I for one agree with you. Thanks for sharing. Rusty Ferrell wrote: Edwin, I knew I would like you. Just know there are believers and non-believers out there. I for one agree with you. Thanks for sharing. Yes, there are those who believe in quackery and those who believe in science. Ron, thanks for beating me to it. Things that are not discussed among friends... Politics, religion and nutrition! That being said, I will don my flame suit. I can attest to the lack of nutritional education for physicians. There is no question that nutrition has a tremendous impact on our health and can be powerful medicine. I am very passionate about the subject but not forum to delve into although maybe fair game given "off topic" section. If anyone is concerned about one's health and how one's diet can influence one's health, please visit Nutritionalfacts.org. The US spends $26 billion per year on statins- some of the most widely prescribed medicines in the world. Total cost in the US of cardiovascular disease was $444 billion in 2010. This number includes lost productivity as well as bypass and stenting surgeries. Yet cardiovascular disease is the leading cause of death for men and women in the US. It kills 1 in 3 people. It certainly has touched the lives of people here, including me. Something in our approach is not working. 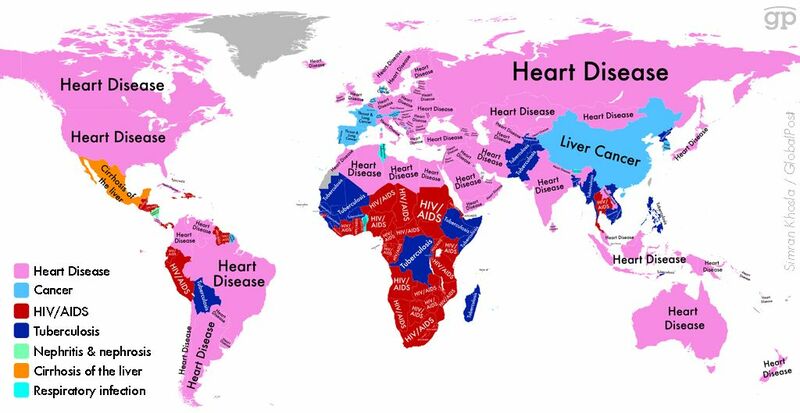 There are populations around the world where cardiovascular disease is essentially unknown. Wouldn't it be interesting to understand why? Eat less, move more.... and don't shop at Walmart. I have seen the photographs. There is no question of the importance of a proper diet when it comes to health and preventing disease. It's your suggestion of what constitutes a proper diet that's ill-informed. I'm moving to Greenland! According to the map it appears that no one dies there!